With great success was realized in Riga, Latvia the 1st Summer school entitled: “Sustainable Transport Interchanges Program (STIP) – Part I: Freight Transportation” from 16th to 22nd July, 2017. 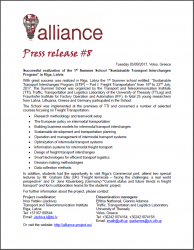 The Summer School was organized by the Transport and Telecommunication Institute (TTI), Traffic, Transportation and Logistics Laboratory of the University of Thessaly (TTLog) and Fraunhofer Institute for Factory Operation and Automation (IFF). In total 25 young researchers from Latvia, Lithuania, Greece and Germany participated in the School. In addition, students had the opportunity to visit Riga’s Commercial port, attend two special lectures by Mr. Graham Ellis (UK) “Freight terminals – facing the challenges, a real world perspective” and Dr. Jens Klauenberg (Germany) “Current status and future trends in freight transport” and form collaboration teams for the students’ project.